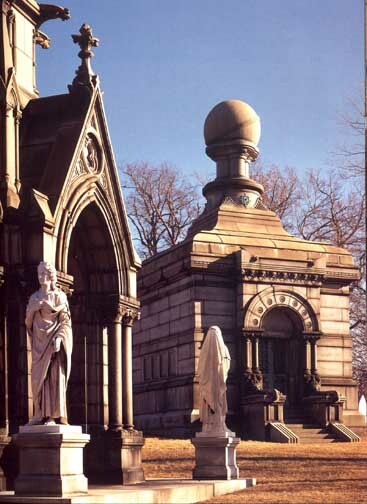 Forest Lawn Cemetery Walden-Myer Mausoleum is a massive neo-Romanesque structure that supports a giant globe, which symbolizes God's sovereignty over heaven and earth. Ebenezer Walden (1777-1857) was an early Buffalo judge and real estate developer, and his son- in -law, Albert James Myer (1829-1880), prognosticated the weather so successfully that he founded the U.S. Weather Bureau. He also became the first commander of the Army Signal Corps.